Prayer is the most powerful weapon we have.Prayer connects us to God and allows His power to manifest in every situation. 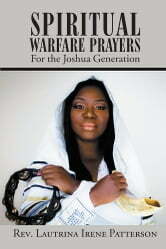 Spiritual Warfare prayers for a Joshua Generation combined with My spiritual growth Journal will take the reader on a healing and deliverance journey.For the next thirty days as the reader reads a prayer they will also journal the released blessing and favor of God from every circumstance that has changed. Spiritual Warfare Prayers will change your life and bring you into your purpose.